Least Count (Millilitre): 10 ml. We offer all types of PP wares, Meausring cylinder hexa and round base.from 10 ml to 1000 mls. 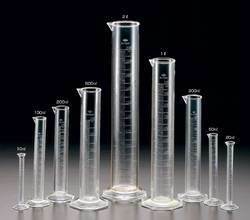 Measuring Cylinders, moulded in Polypropylene are single piece cylinders. These autoclavable cylinders have raised prominent graduations for easy reading and have excellent contact clarity. The broad base provides good stability. Being a leading enterprise of this industry, we are offering a huge range of 50ml Nessler Cylinder.